The Society’s office and museum are in the basement and Coach House of Kelmscott House, Hammersmith, Morris’s London home for the last eighteen years of his life. During this time he ran his manufacturing company, Morris and Company, at Merton Abbey, he founded the Kelmscott Press and he held Socialist League (later the Hammersmith Socialist Society) meetings in the Coach House. Today the Society’s talks and other events are held in the Coach House; it also hosts exhibitions of works by Morris and his wider circle. See our Events and Our Museum pages for details. Membership of the Society is open to all. Please see the Membership page for more information. The Society’s Constitution can be downloaded here as a PDF*. The William Morris Society in the United States maintains close ties with its British counterpart, though it holds separate events and issues additional mailings. U. S. residents who join the US Morris Society are automatically enrolled in the UK Morris Society. 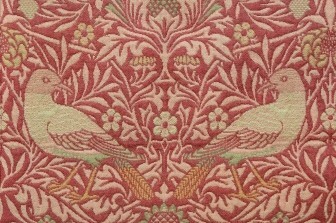 For more information, see the website of the William Morris Society in the US. For Canadian Morris enthusiasts, please see the William Morris Society of Canada.